Editor’s note: Lydia McAllister is a graduating senior at Joplin High School in Joplin, Missouri. She writes for the school newspaper, The Spyglass, plays soccer, is an officer with the National Honor Society and was a member of the school’s state champion Constitution Team. In the fall, she plans to attend the University of Missouri to study journalism. 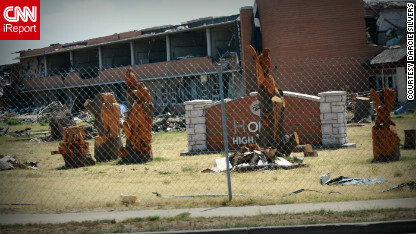 Last year, Lydia wrote about returning to classes at a temporary high school after a May 22, 2011, tornado destroyed parts of Joplin, including the old high school. (CNN) - It’s so easy to fall into the trap of “What if…?” What if the tornado hadn’t torn my house to mere sticks? What if my dad’s business was still standing? What if my school still had walls? 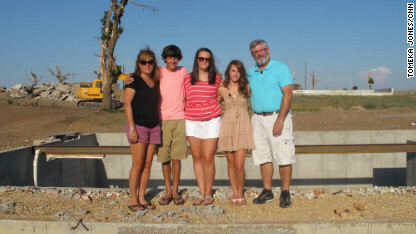 One year after an F5 tornado blew through town, we’re rebuilding, and we’ve made it through a school year. On Monday, I’m graduating. The year at our high school in the mall had its ups and downs. I missed having the ninth- and 10th-grade students around, and I know they wish the upperclassmen were with them, but we had to work with what we got - and what we got is an absolute miracle. It isn’t some foreign building; it has really become a high school. Although laptops make life easier, the change to a “paper-less” school has been hard on the teachers, and I sometimes felt like I wasn’t learning what I could if I didn’t have Twitter open in the next tab. This year taught me lessons that will help me in college: Your education is what you make it. You can choose whether to get a lot or a little from your classes. Joplin High School will be rebuilt and will open in a few years. I feel beyond blessed to have President Barack Obama speaking at our ceremony. How many high school students can say that the president spoke at their graduation? I know there are mixed opinions about politics, but this is a great honor. I might not vote for him in the upcoming election, but I can still appreciate how important this is for Joplin. I can’t help but smile when I drive down Range Line Road on the route to school. It’s been amazing to watch businesses spring up right and left. Now we have Home Depot, Academy Sports and Outdoors, Wal-Mart, Wendy’s, Sonic. My town finally looks like what it should, not like a war zone, but like the place I grew up. There’s still a lot of work to do. My family is still in the rebuilding process. I can’t believe how many decisions go into building just one room. What to stain the trim? What light fixtures to put in the bathroom? My mom seems overwhelmed by the building process, but I know she’s happy to see her dream home become a reality after the home where we’d lived my entire life was destroyed. My dad and his partner will break ground on a new dental office on May 23. I’ll never forget how my dad has been our rock, patient and flexible while getting our lives back on track. I can’t even put into words how much I admire him and how proud I am to have him as my dad. Any time I would wake up from a “tornado-mare,” as I like to call them, I think about the moments right after the storm hit, when we walked to the basement stairs only to see the mangled gray sky instead of our house. My dad pulled us all in and promised us we’d be OK - that he would make sure we’d be OK - and instantly, my fear dissipates. We are OK, just like he said. The McAllisters' home was flattened by the tornado. The tornado was something none of us had any control over. It was one of those things that you can let define you or you can let it help shape you. For me, it’s the latter. I’m a stronger person as a result of what I’ve been through in the past year. They say you don’t know how strong you can be until you have no choice, and I can vouch for that. My strength comes from the people I’ve met since that day - the neighbors who came to help pick up our lives days after the storm, the volunteers who handed out water bottles and hot dogs, the women who painted bricks with the image of Joplin High School for every senior. Their strength kept me going, and for that, I will be forever grateful. The tornado really taught me how to appreciate what matters. All the things accumulated in a lifetime can be strewn across counties in a matter of seconds, but what matters in life are the loved ones that walked out of that basement with me and being strong, even when you have nothing but the clothes on your back. I like the idea of graduating right before the one-year anniversary of the tornado. It will be the end of something one day and a chance for closure the next. On May 22, I expect the feeling to be relief - relief that I survived and so did my family; relief that my town doesn’t look like a bomb was dropped on it; relief that trees are growing again; relief that if all goes according to plan, my little brother will be part of the first class to graduate from the new Joplin High School. But most of all, I will feel relief at the fact that even when my world seemed to end, that pain didn’t last forever, to know that this, too, shall pass. The opinions expressed are solely those of Lydia McAllister. I like the helpful information you supply in your articles. I'll bookmark your blog and test again right here regularly. I am fairly certain I will be told lots of new stuff right here! Good luck for the next! Through the depths of despair, your light blazed bright. May the light of this country continue to shine through you today. Because if you look to every immigrant face they have hope! and where hope take people to. This tornado tragedy should NOT happen to all of those innocent people. Lydia, you haven't learned the real lesson yet. Let me tell you a potential explanation, the word of Joplin can be thought as combination of two words, that is Joplin=Joe+Sarah Palin. If you want to avoid this type of tragedy forever your township should change the name from Joplin to whatever loving name. It's just a name, life matters whole lot more. bzonline123..what on earth are you talking about?? Joe & Sara Palin?? HUH??? ZzzZzz...what did Lydia ever do to you??? This sia remarkable community because of it's remarkable people..Lydia is a fine example of that..she is our future and when I read what she has to say the future looks a whole lot brighter! Well done Lydia! To think that your family lost so much . . . your dad's business, your home & all your possessions . . . . is unimaginable. Your mom & dad are great role models. I moved from Jasper County just in time. I'd rather outrun a hurricance. Please tell your mom hi for me. Enjoy your college experience. I'm sure you'll have a fabulous time! Wishing your family all the best! If you are posting this for comments or to turn a beautiful thing negative, you have no place on this page. This is disrespecting a young girl and her friends and neighbors who lost everything they had. Every material thing they had is gone. So if you want to be the person that everyone can't stand, do it someplace else. Not here. This is what I call American perserverece and pride. I was worried and thought that it had gone extinct but the fact that a Senior is able to look past all the destruction of her material things and know that its the people who really matter is uplifting. She is an inspiration and makes me feel proud to be an American again. Great article, Lydia. Your parents must be so proud of you as well as your brother and sister. In some ways you are fortunate to learn the hard lessons of life so soon. That "this too shall pass" is not a lesson usually learned by teenagers. You're already ahead by learning this as well as the importance of family and the illusiveness of material things. Have a great time at MU and come back to visit us often. Lydia McAllister, you are a class act, and I have no doubt that you will go far in your life. It sounds like you are an exceptional young woman with her priorities straight. Best wishes and congratulations on your graduation from high school. I hope your family is rebounding with the resiliency that you are, and that Joplin is back to its "new normal" soon! Joplin resident that lost their home in the tornado. What? Your comments make no sense at all. I think you have way too much free time on your hands. I have a special place in my heart for Joplin. I have visited many times during an 8 year period when I worked for a local business located in Joplin. The close-knit community and small town feel had me considering a move there several years ago. I have followed the stories of Joplin since the tornado. I knew in my heart that they would band together and rebuild their town . The citizens of Joplin are a strong, resilient people. Your article very much reflects those characters of the community. I know the anniversary is going to be a difficult one for many. My heart will be there......even if I can not. Thank you for taking the time to give us all another reminder about what is truly important in life and I'm glad you, and your family have stood strong on the road to recovery! My family experienced a similar tragedy the year before in Millbuy, Ohio where we lost my brother, sister-in-law, and nephew. Without family and a strong community behind us, it would have been an infinitely more difficult recovery process. Thank you, once again, for sharing your 'silver-lining' with all of us and good luck in the next (exciting!) chapter of your life! Umm... ZzzZzz, if you didn't want to read it, why did you click on the story? And what is "her kind" that has caused hardship on others? Tragedy often helps puts things into perspective. As a Joplin resident I have experienced this myself and have witnessed it within our community. For me it has helped solidify the importance of faith, family, and friends. The significance of our relationships is so much more important than the material things that we (I) so often find ourselves pursuing. Thank you for sharing with us Lydia. So true, Robert. My Mother always told us that: It's people that matter, not stuff. Our choices need to be made, everyday, recognizing the superior value of people over things. Thank you, Joplin residents, for sharing your experiences with the rest of us. She is a blessed lesson for us all. I hope this gets by the CNN censor police. As a retired teacher I can appreciate the struggles you, your family, your teachers, and the community have made to make sure you are prepared for a futrue after high school. I commend you on the humbleness and dedication you have expressed to everyone for all their hard work to rebuild your community. Good luck and best wishes as you embark on the next level. The past is just that and your future looks bright. A great and well-written article from the heart. God Bless. I can't even begin imagine what you've been through. Best of luck for what looks to be a bright future for you, your graduating class, your family, and your community...God bless. Excellent article - you are going to be a GREAT journalist someday, I can feel it!! Free speach. It's not just for breakfast. This should be read at every graduation across the U.S. The wisdom, faith, and love shown by this youg girl are far beyond most people her age. Thank you Lydia for sharing your soul with us. Point taken. But, let's not go overboard to assuage the ultra-finicky CNN censors. My thoughts go out to all in Joplin who are still rebuilding from the nightmare that descended upon them last year. I hope that those who lost homes, businesses and loved one are still recovering and receiving all the support they need. Thank you for sharing this young lady's thoughts here! Nice article, Lydia. I'm happy to see you are an aspiring journalist. You are a strong and inspirational writer. I believe you will go far in your career. I know your family is proud of you! Best of luck to you! Ms. McAllister's aricle truly shows that she has learned a great deal, I believe a good part of it was taught prior to the tornado that changed her life. The best part is that she took all of her experiences to come to the one realization that will no doubt guide her for a long time – "this too will pass". Best of luck to Ms. McAllister and all her classmates as they go forward on Monday to new opportunities, challenges and passings. God bless all of you in Joplin. Ms. McAllister's nicely written words offer "lessons learned" that can benefit all readers. Best wishes to Joplin's Class of 2012!